Fall 2016 brings us lots of strapped and black trousers. Some baggy, some tailored straight. This pair is tapered, tailored straight. The strapping is super-cool and very intricate. I would buy a pair right now if I could. Although, It’s toward the end of January 2015 at the moment, Fall 2016 seems like a long time to wait for a pair of pants. Sounds like it’s time for another DIY project. Now that I’m home in HI, I’m thinking I’ll use Silver and Gold safety pins, the straps I have left over from NY and I suspect I’ll do a bit of hand sewing on them. Once they’re finished, I’ll post 1-2 pairs on this blog. If anyone knows where I can get some flo-orange straps, LMK. I think they would look dope on top some black suit pants. See you on the Streetz! This week it’s the amazing NFL Pro Bowl Beach Party and of course the game. If You’re in town, it’s time to get out your (In this order) Best kicks, suntan lotion, 3/4 length shorts and your favorite teams jersey. Feel free to email, text or stop by any of the festivities Friday thru Sunday and say Aloha. *I also like this model’s shoes, but I doubt I will attempt to make a pair of them. 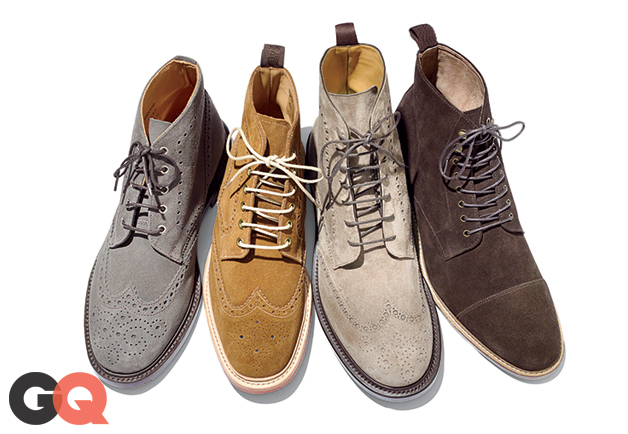 Looks like Fall 2016 will be a great year for real sturdy, stylish shoes and boots. If you can’t wait for the strapped pants, check out these nice strapped bombers by Stampd. Street and Skate Store Supreme has teamed up with traditional Ivy League Brooks Brothers for a Bold and pretty darn stylish Seersucker release featuring the jacket seen above and matching pants. As you can see the Jacket has the Red and White Supreme tag along side the classic Dark Navy and white Brooks Brothers Tag on the sleeve. I suspect these are two tags that will stay on most buyers sleeve as they rock this look for Spring 2014. 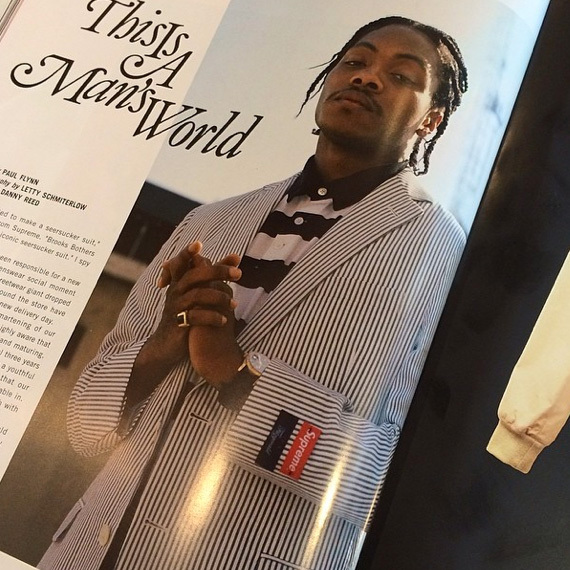 The picture above appeared on the Supreme London Store Manager’s Instagram @mrjagger_ After researching it a bit on the net, it seems it’s a picture taken from an article in an upcoming issue of the UK’s Man About Town Magazine. The release date of the Jacket and pants still seems to be a mystery. Update: Monday April 28, 2014. The Seersucker suit will be available in store NY, LA, London and on-line Thursday May 1, 2014. Available in Japan on Saturday May 3, 2014. Price $549. While doing this blog posting I noticed that most Supreme drops are on Thursdays. More pix of the suit here. The April 10 newspaper edition of WWD confirms that this jacket along with a pair of trousers will be released soon by the two Mega Brands. 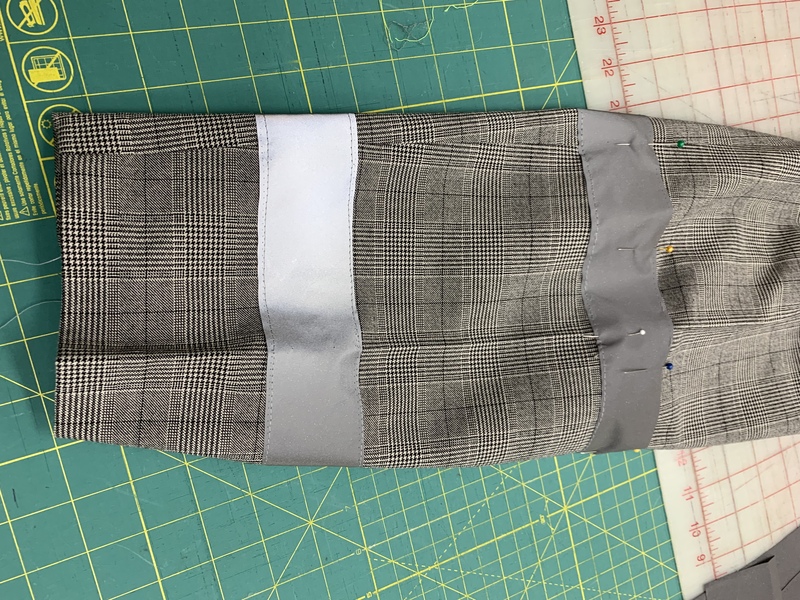 According to WWD the lining will have a black and white star pattern and the suits silhouette is Brooks Brothers’ slimmer and younger Fitzgerald model. 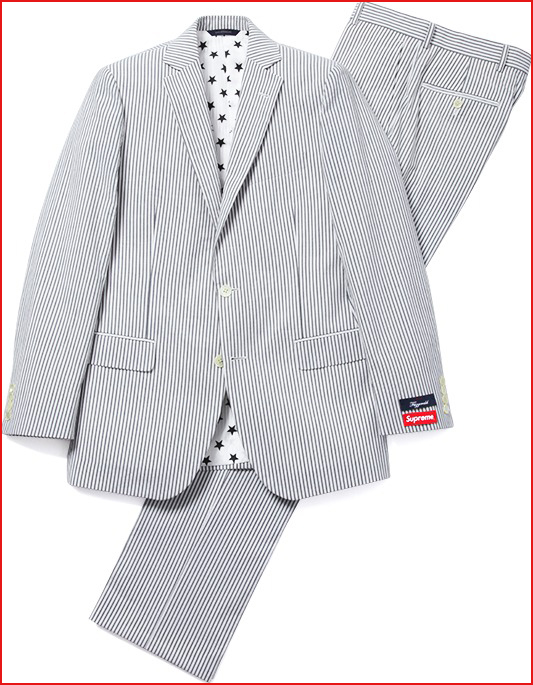 The two piece seersucker suit will be available at Supreme. From what I’ve seen during my December trips to NYC, Supreme has some pretty long lines for their limited edition Shirts and Kicks. I would suspect a BIG line for this gear. And I kinda’ doubt it will show up on their on-line boutique. But it’s for sure worth a try to look and find out. I wonder if like the shirts and kicks; if this suit goes for double or triple on E-Bay? My vote would be yes. And Yeah, I admit it would also keep the tags on it and wear it out of the house just like the picture above. Brooks Brothers has done some things with Junya Watanabe in the past and they typically work with designer Thom Browne with their Black Fleece label. 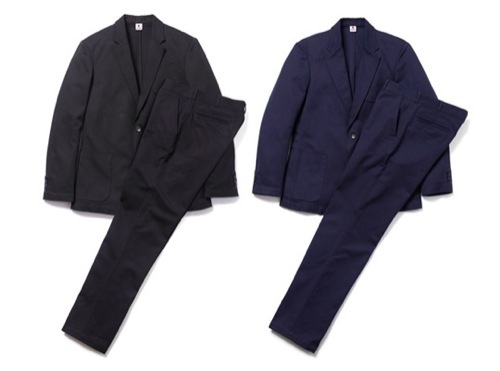 Supreme has collab’d with many including Nike, North Face Comme des Garcons, Vans, Champion and in 2011 they worked with Adam Kimmel on an unlined black and navy two button suit jacket and pants made from Italian cotton Twill. I think that this Seersucker collab is a Big Time Winner for both the younger and older fans of both brands especially the Supreme followers. I could see this jacket worn by many a bike courier and fashion designer in NYC and by many others in various professions throughout the world. Streetzblog recommend that you should get this very stylish suit collab if you can! Have a Good Friday and a Happy Easter. If you get a chance check out my radio show this Saturday April 19th from 3p-6p Hawaii Time on KTUH.org. You can catch it on the tune in app or by going directly to ktuh.org. See you on the Streetz, on the radio, at church and at the Beach this weekend. Yesterday, I surfed for the first time in a few months. It was extremely fun and nice to get LOTS of fresh air on a weekend. Today, many bones in my body are hurtin’, so back at the computer. Actually a bit overstimulated at the moment, TV is playing Blood and Chocolate, Radio is coming from my iPhone to the Beats Pill playing Chilltrax from somewhere in the World and yes, computer is also on blasting the Lanvin fashion show, as I read about Lanvin in M-The new class of Man Spring 2014. The newest research says it’s better not to multi-task anymore. HA! When it all goes well together, it works well. They’re probably talking about multi-tasking while attempting to do very different elements of intrigue at the same time. Out of all the different stimuli surrounding me, I picked the Lanvin Fall/Winter 2013-14 Runway Show to provide you with today. Big Backpacks: Designers are pushing the Hi-End Backpack. In December 2013, I saw a Givenchy Backpack at Barney’s for over $1,000. Wonder how much these BP’s go for? When did Backpacks go from carrying books and pencils to school to the runway? Crazy Eh? Very Tight Ultra Skinny Trousers: These practically look like they are painted on. I like the fact that you can see the Kicks even better with the pants like this. They look like they were sown directly on to the models. Probably a look that would work in Paris. Maybe just a tad uncomfortable. Baggy, Long Big Bottom Pants: The Complete opposite of the skinny Jean. These are so long they hit the floor near the ankle. Interesting look, yet too hard to see the shoes. And Hey, which trend is the trend? Tight and Skinny or Long and Baggy? Hmm. Colors: My favorite Blacks and Greys. Along with Taupe with matching Backpack, a bit of Red and a tad of white and off whites hues. My Favorite Look: The grey double-breasted Jacket that is short, cut off at the waist. With the pants that are tailored and cropped around the ankles. Shoes: I’m a sucker for white soled shoes and the beginning of the show has many of these, along with what looks like a slightly flourescent yet muted green sole. I also like the Cordovan boots. Nice contrasting color with the various shades of the pants. There are some white boots you may notice, those are just a bit too bright for my personal taste. But they do make a statement if that’s the look you’re looking for. The Music: Just chill enough to be up beat at the same time. Nice choice. Vibrams: A particular brand of rubber soles. One popular version is their white wedge or “Cristy” sole seen on the boots of dudes whose pictures end up on the internet. Here are some of my favorite White Soled Shoes and Kicks. 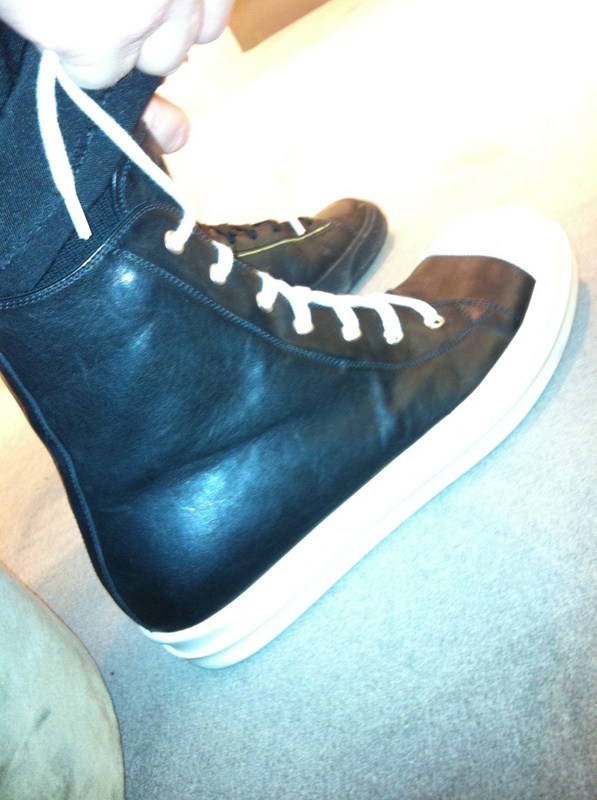 Note: The Rick Owens aren’t really mine, I took the picture of my feet in them at Barneys NYC. Rick Owens Ramones in Leather with White Rubber soles. Grenson-Fred-Black Calfskin Leather/White Vibram Sole. Made in England. Bought at Barneys NYC. Jeans..Models Own. 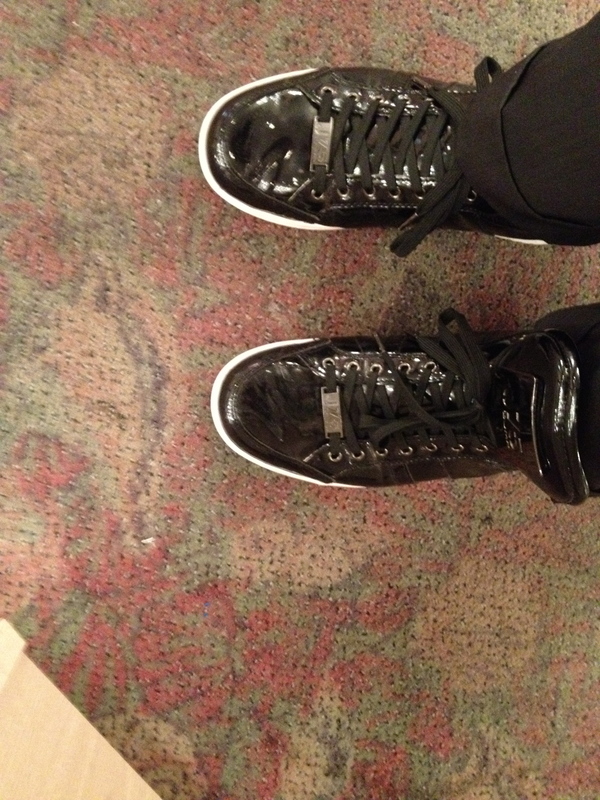 Black Patent/Whit Sole JUMP Sneakers from their boutique in Soho, NY. Carpet is from a room in the Roosevelt Hotel in NY. 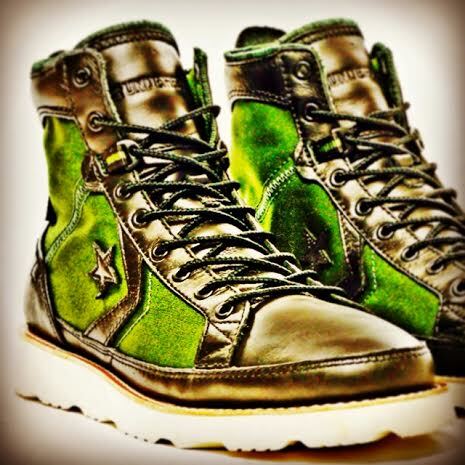 Green and Black Converse All Stars with nice white sole. 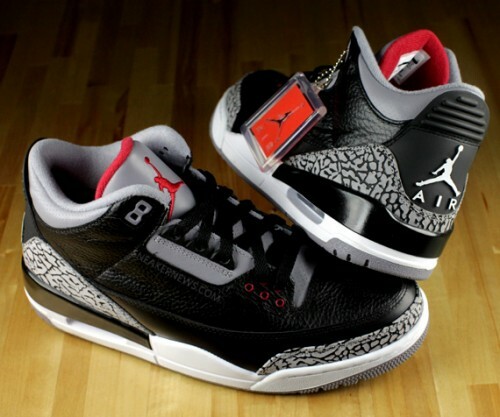 These are on my wish list. 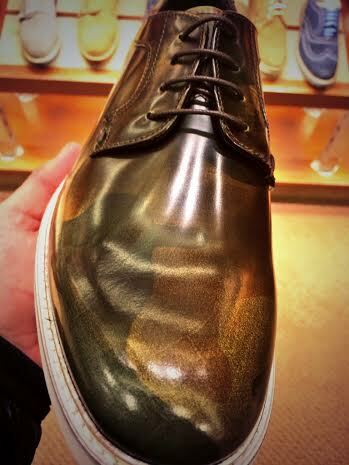 Camo Dress Shoes with White Sole. 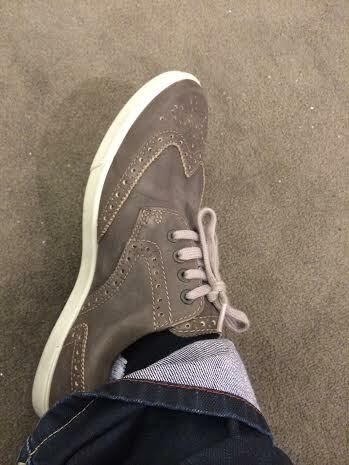 Saw these at Nordstrom in Dec 2013. Tried them on but they didn’t quite fit. Too Bad. Could have worn these to work. Ecco-Sporty Dress Shoe/Sneaker all in One. With White Sole. I do own these. Wore them to work 1x. I like hi-tops better. But will try them again one day. 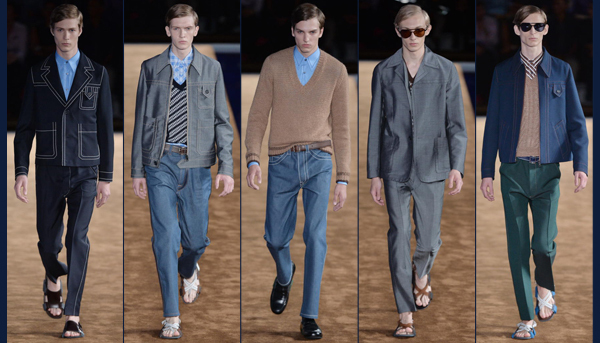 I never knew Louis Vuitton made this many clothes for Men. When I think LV, I think female handbags. Nice to see all these high quality Luxe-Life fashions for men from the king of logo’d bag. Fabric: So luxurious, it seems as if you can actually touch and feel the fabric as it flows along the runway. 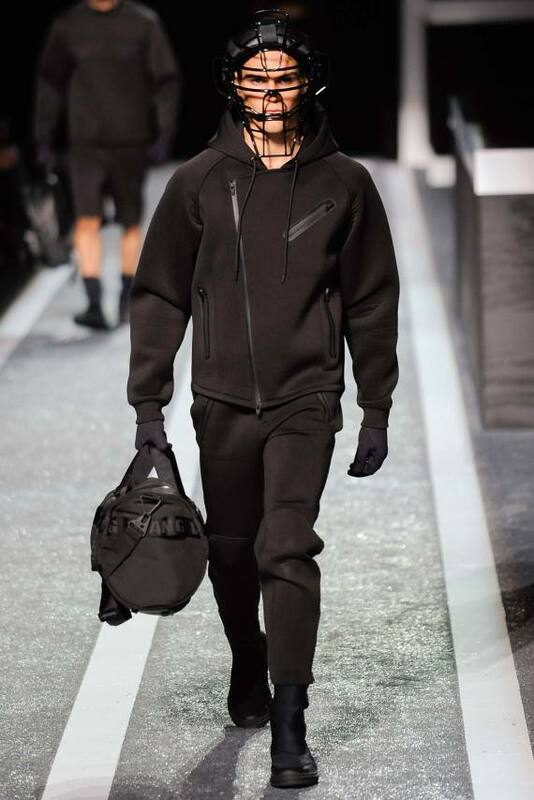 Color: Still liking the Blacks and Greys for the Fall/Winter 2014-15 Season. Jackets: Traditional overcoats with untraditional fabrics. Stripes and very subtle plaids. There’s one in this show I would buy in a heartbeat. Understated, yet when seen up close, extraordinary use of discrete color and plaid. Sunglasses: Can’t go wrong with the Cobalt Blue and Black tones. Slick, Cool, Modern, Accessable and right on trend. The Floor: Before I saw the fashion Show, I saw a picture of the futuristic blue hued floor. This is what attracted me to the runway show. Quite nice use of color and space. The Bags: Check out that Silver Metallic rounded Oblong. Luxe-Life Fashion meets Urban Survival, meets Possible Militaristic Missions. Like two shows in one. First half is various shades of grey. Second half is the Court Jester Balloon jacket and pants show. Enjoy! Grey: There is still time before Fall/Winter 2014-15 to get your grey on. This show validates a theme we’ve been talking about on Streetzblog for a while now. Grey or shall we say Gray? is the BIG color for Fall/Winter 2014-15. Here we see many different shades, various materials and even a grey plaid fish shown to us all many times throughout the show. Textile Mix Tape: OnTrend with the mixture of different types of plaids, shades of grey and other types of materials all in one look. It maybe an ode to the Eco Friendly Fashion Future of re-purposing clothes or just looks very hobo-chic Ala Mode of the moment. Either way, it’s way Dope! Built in BackPacks: Ok, so this is taking the Back-Pack to another level. First they look like the back packs blend into the jackets. Then it seems that they are actually built right into the jackets. Either way, very cool. Nice subtle eye-catching detail. Hey-you wouldn’t lose or forget to bring your gear with you when it’s always with you built into your jacket. Nice for the multi tasking always on the move 21st century man. Setting: The Magical Forest? Alice in Wonderland? An ode to the upcoming Grey, Gray World? Interesting, the fish and other animals are quite fun to see. Not sure about the animal hats and head dressings on the models. It does give the runway a bit more of a theatrical presence, just a bit scary. Shoes: Grey with black soles. Time for a change from the Black Kicks with White soles. Just when I thought I didn’t need another pair of shoes and these are getting ready to come out. I would like to try a comfortable high top with a cushy black crepe sole. My feet still hurt and I really do need to find something that is comfortable. Thom sure isn’t being understated about the Grey trend. It’s seen everywhere from Jackets to Trousers, Fish to Shoes. Grey will be the new black for Fall/Winter 2014-15. The Shirt: Fitted plaid in medium nice shades of grey and blue. Notice the top button is buttoned, the bottom loose and flowing, see the detail on the button down collar, And the fit is not too skinny and for sure not to oversized at all. Quite a perfect fit, colors on spot and worn with style and flair. Also, shirt is untucked below the jacket, one of my favs to rock at a Sunday Brunch. 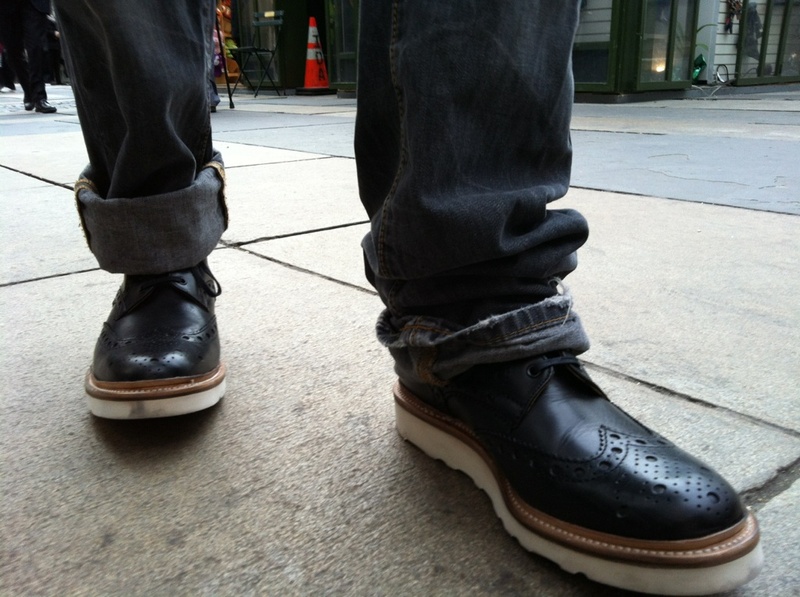 Looks like it could be Rag & Bone or McNairy. I would guess $200 or more. Don’t know for sure, but quality, fit and style make me think it’s from a pretty posh brand. The Pants: A perfect shade of black with just enough drop to be modern, yet not overly done to become parachute pants. Nicely tapered down the leg. Once again, not to tight or too loose, perfect fit. I would suspect, not Dockers, maybe Armani, Prada or Givenchy. The Jacket: The darker color matches nicely with the pants and the Golden Color goes quite well with the man’s Skin-Tone. Sleeves a tad too long to be practical, yet the length gives it a nice Street Vibe, so no biggy. He could always roll them up a bit. And maybe, its more me than others, but sleeves tha are too long on shirts and jackets just drive me crazy as the day goes on. 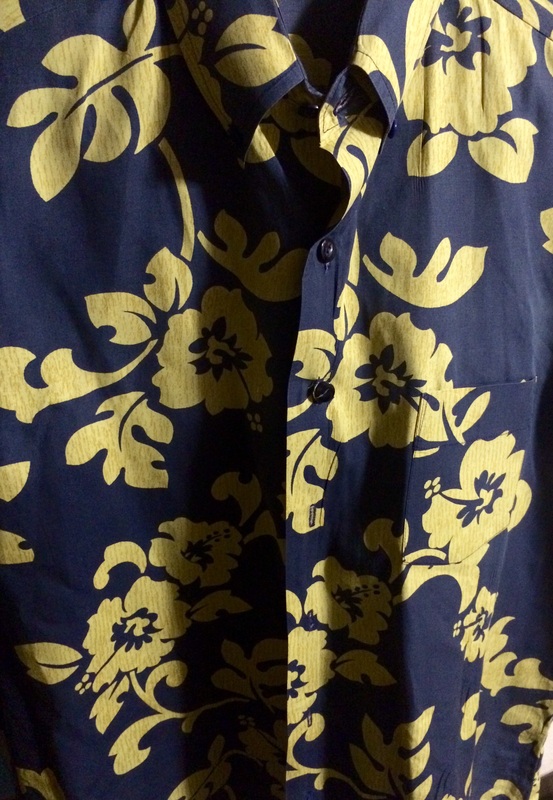 Brand, possibly Vintage theatre garb or Versace. I bet it or something similar can be found on Ssense. The Haircut: One of the most popular cuts for the first quarter of 2014. I think it would look a bit better with less on top. But this is the look at the moment. Fits the Vibe of the outfit nicely. And No I wouldn’t add a mustache or a beard, even though many hipster sites are pushing that look pretty hard right now. And also no, he doesn’t need a Monocle to look cool. Could use a bit more of a 5:00 O’ Clock shadow stubble, but once again..no biggy. The Stare: Looks like he’s about to smack a rat or jump over a slush puddle. Not too happy, not too sad, gives the whole look some extra personality. The Shoes: I know you can’t see them, but I can style the kicks extremely easily with my imagination. This outfit would look good with Black High-Top Grenson’s with the white soles, a pair of all gold low-top Adidas, Black or Navy 8 eyelet Doc Martins, maybe some Marc Jacobs tinted black/Gold High-Tops or even some nice standard black combat boots (Pants tucked into the left with tab out and full length with a slight unnoticeable quarter cuff pant leg on the right ..of course). For March 2014, Streetzblog goes with an A+ on this look. What do you think? Rock it or Schlock it?